Just as much as our bus services are safe, convenient and affordable, our ferry fleets are the same too. One of our greatest ferry services provided at BusOnlineTicket.com is the one that routes from Singapore to Batam, Indonesia! Only a mere 45 to 70 minutes of travel above the sea in the comfortable ferry service, you can get away from the hustle and bustle of the city to the peaceful island of Indonesia. This ferry service is operated by Batam Fast Ferry Pte Ltd, an established company that provides faster ferry service to Batam from Singapore. There are various timing slots available from morning as early as approximately 7:40 a.m. to evening as late as around 9:40 p.m. in order to provide more online booking flexibility (timing slots differ at each pick-up and drop-off points). 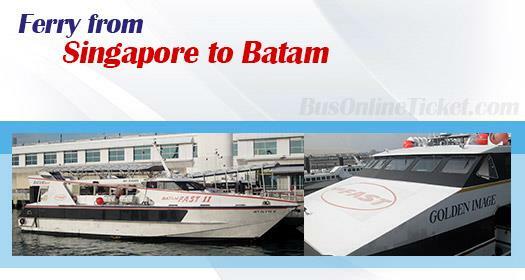 It is no wonder Batam Fast Ferry is known for its fast ferry service to Batam from Singapore. Plus, it only takes SGD 26 per way with our online booking ticket from Singapore to Batam! Rather than just the beaches, you should also explore other intriguing activities in Batam. For instance, Barelang Bridge offers an astounding view especially if you are a sunset-lover, indulge in a body-pampering massage after grabbing the goods at the Nagoya Hill Shopping Mall or capture the beauty of the Maha Vihara Duta Maitreya Temple. You can also go shopping at Mega Mall Batam, or head into the town of Nagoya Batam for sightseeing and tasting local food. Lastly, don’t forget to book for an experience of Batam spa and Batam massage to melt away your tension. So, remember to plan your holiday ahead as the tickets for online booking Singapore to Batam can be easily sold out especially during peak season that you should book your tickets at least two weeks in advance. Click on our booking machine now to explore the rates and availability of ferry to Batam from Singapore.